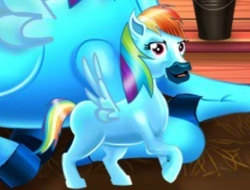 This is one of that rainbow dash games where you have to help our pony to give an appropriate birth. Her little beloved baby pony is on the way so don't miss it and be there to be sure that Rainbow Dash is feeling good and she is having a stable condition. This game can be placed in the category of pony games but also in girl games because it put you in position of being a nurse, a doctor and a friend to our future pony mother. Don't rush her and see if she is ready for pregnancy, if not help her and give her some food, like carrots , apple, or water or maybe some hay. Don't forget to consult her, to give her an injection and after she give birth to sterilize the baby and of course the mother too. Rainbow Dash and the New Born Baby 0.00 between 0 and 10 based on 0 votes.